Movie Review - 'A Cat In Paris' Nominated for an Academy Award for Best Animated Feature, this hourlong trifle follows the adventures of a feline playing family pet by day and cat burglar by night. Critic Scott Tobias says the handcrafted film is a pleasant diversion, if a bit overplotted. The Academy Award for Best Animated Feature was introduced in 2001, and throughout its brief history, it's mostly been a mechanism through which to honor whatever Pixar does every year. Yet the act of choosing nominees from the very shallow pool of feature-length animated movies has resulted in some encouraging side effects. Sometimes the nominees are a bit of a stretch — we're looking at you, Jimmy Neutron: Boy Genius — but the Oscar spotlight has occasionally given a lift to relative obscurities like Sylvain Chomet's The Illusionist and The Triplets of Belleville; or Persepolis, an adaptation of Marjane Satrapi's vivid graphic memoir of growing up Iranian. Last year's category gave two such curiosities a theatrical boost: First, Spain's Chico & Rita, a vibrant musical set against the backdrops of several major cities in the late '40s and early '50s, and now France's A Cat in Paris, an hourlong trifle that likely wouldn't have seen American theaters otherwise. An argument could certainly be made for the film as a pleasing divertissement, but as an Oscar nominee? Let's just say that the producers were fortunate that Pixar whiffed with Cars 2. Directors Jean-Loup Felicioli and Alain Gagnol, working from a script by Gagnol and Jacques-Remy Girerd, give A Cat in Paris a lovely handcrafted appeal, full of angular faces, slightly off-center buildings and enchanting rooftop views of the city at night. 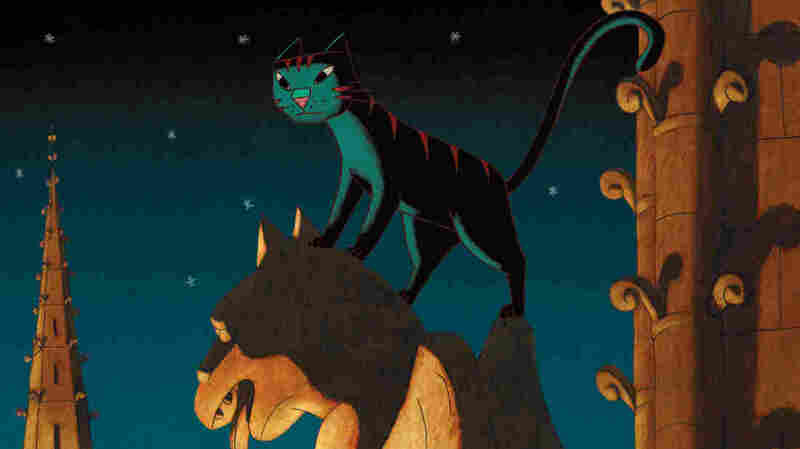 The feline in question in the main event is a red-striped black cat named Dino that skitters between two residences. By day, Dino snuggles with 7-year-old Zoe and her detective mother, Jeanne, who are still grieving the death of their father and husband, once Jeanne's colleague on the force. At night, the cat slips off to join Nico, an artful burglar, as he scales buildings, gives bungling security guards the slip, and dashes off with sacks of jewelry. Worlds collide when Victor Costa, the vicious gangster responsible for killing Zoe's father, kidnaps the little girl in a bid to steal a priceless statue, and Nico becomes her unlikely protector. For the sake of dramatic convenience, the script renders Zoe mute with grief, so when it comes time to explain to her mother that this thief is her guardian, she doesn't have the words for it. That minor cheat aside, A Cat in Paris moves swiftly through the paces, tying together the various plot strands while paying homage to old-school film noir and modern gangster movies like GoodFellas and Reservoir Dogs. Though the violence has been ginned up mysteriously and unnecessarily for a family-friendly film — the slapstick abuses dished out to a yapping dog are particularly harsh — there's hardly a frame wasted here. The trouble with A Cat in Paris lies not in its orchestration, which is mostly impeccable, but with what little is being orchestrated. It's well plotted but a little rote, clever but a far cry from ingenious, attractive but not particularly evocative. When it ends, it leaves behind the faintest of paw prints.